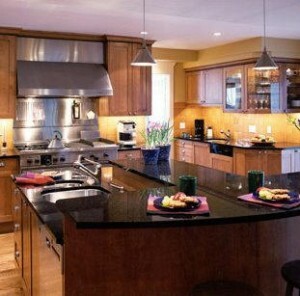 At Pierson-Gibbs, Granite countertops are standard. With public awareness increasingly turning to the use of natural materials in the home, Granite has become the countertop of choice for today’s kitchen designer. Synthetic solid surface materials are no match for the richness, depth, and stellar performance of real granite. Unlike laminates and solid-surface materials, a hot frying pan has no effect on granite’s mirror like finish. The diamond-like hardness of granite makes it virtually impervious to abrasions, stains, and extreme heat. Most important: by choosing a granite countertop and/or island, you not only give your kitchen timeless performance and beauty, you increase the value of your home.